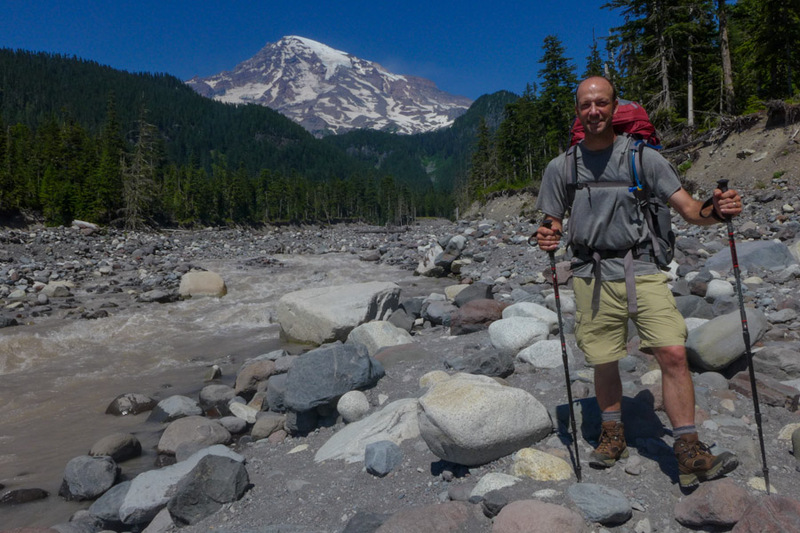 The Wonderland Trail on Mount Rainier’s west side has a lot to offer the intrepid backpackers who venture here. This section of the trail is not easily accessed by road, so few day hikers reach this quiet corner of paradise. 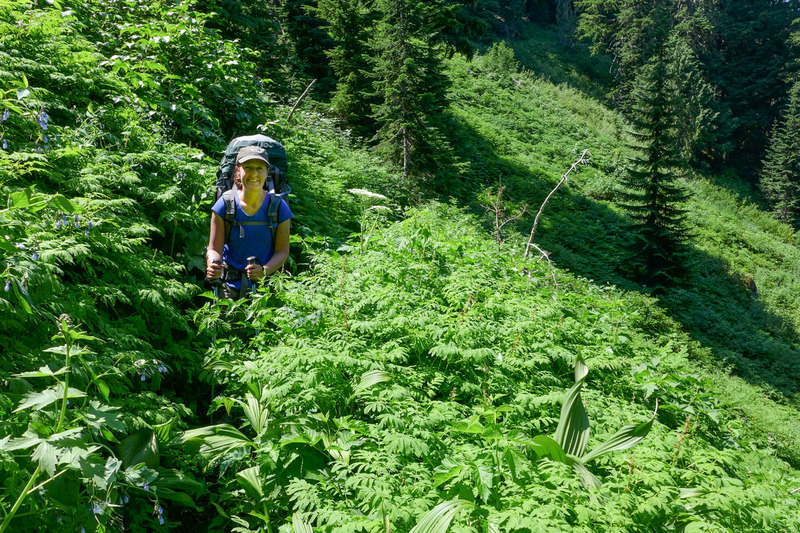 A couple of monster ascents through old growth forest will have you huffing and puffing, and the stunning views of the mountain from Klapatche Park and Emerald Ridge will take your breath away. St. Andrew’s Lake offers a picture-perfect chance to cool off in ice-cold waters while a couple of dramatic river crossings are sure to get your adrenaline flowing. If you’re lucky, you might catch a gorgeous sunset from above the tranquil Golden Lakes. 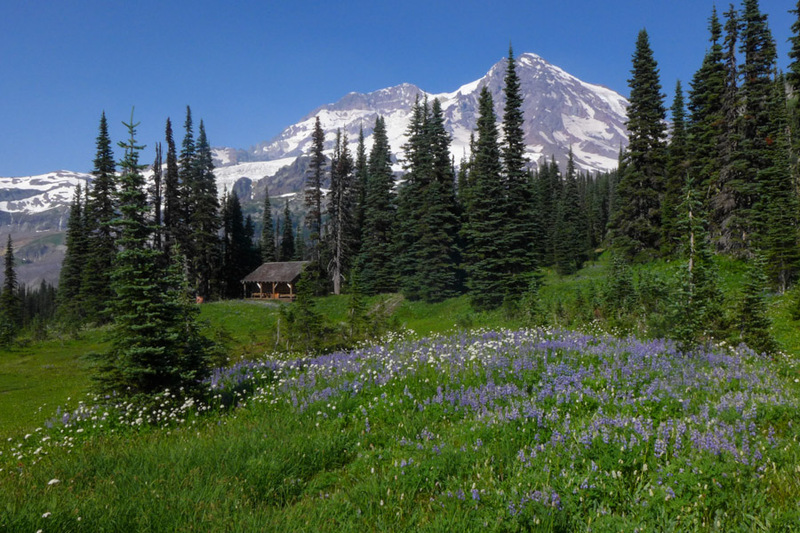 Wildflowers abound as you stroll through Indian Henry’s old hunting grounds on your way to your next cache and a well-deserved hot meal at Longmire. A wander down the west side is well worth your while! 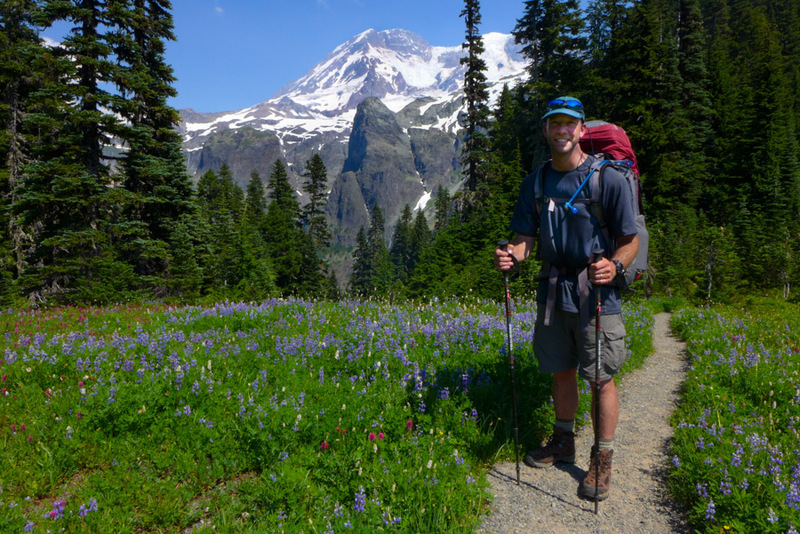 What follows is a detailed description of Days 5-8 on the trail. We hope that this first-hand information will be valuable to those planning this hike. If that’s not you, we hope that you’ll enjoy looking through the photos anyway. Happy trails! We slept in after a challenging Day 4 and had a lazy departure from camp knowing we only had 6.1 miles to travel today. Much to our chagrin, that carefree feeling evaporated instantly about ten minutes down the trail when we saw the condition of the river crossing in front of us. When we got our permit at Longmire six days prior, the ranger had warned us that the bridge at South Mowich was out. The level of the river here changes rapidly with the snowmelt coming from Rainier, and the bridge frequently gets washed out over the course of the summer, especially after a rainfall or a warm, sunny day. Trail crews work hard to replace the bridge, but a new one typically only lasts a short while. This, of course, scared the bejeezus out of me, so I was utterly relieved when I finally heard through the trail telegraph that the bridge had been replaced. 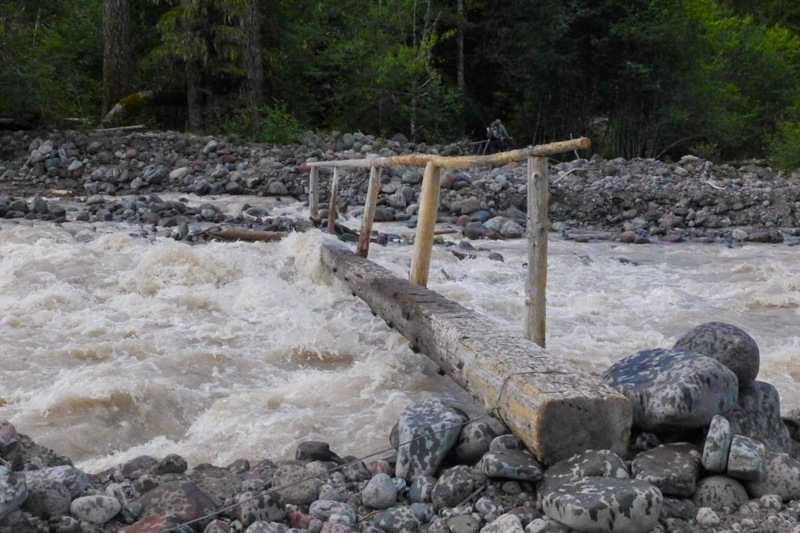 By the time we arrived that particular morning, however, the water was high and was already cresting the newly-replaced log bridge in several places. Not only that, but the bridge only got us about two-thirds of the way across the river. The rest would have to be forded, and the ominous sound of boulders being rolled by the sheer force of the water had us shaking in our boots. I stood there frozen wondering what on earth I had gotten myself into. Seriously, check out this footage of the scene. What would you have done? Matt took charge and convinced me we could do it. Besides that, we really didn’t really have another choice, right? We quickly changed into Crocs, and Matt led the way. With a sturdy handrail to hold onto, crossing the bridge proved easier than fording the river’s side channels, but we made it across without too much trouble. We celebrated the feat while recovering on a log nearby before changing back into our boots and hitting the trail again. The rest of the day was rather uneventful in comparison. It was a long 3.1 mile trudge up 2000 feet through shaded pine forest. To keep our mind off the climb, we kept our focus by counting the seemingly endless series of long switchbacks. We counted 33 in all, but don’t hold us to that number—I wouldn’t be surprised if we lost track somewhere along the way. We were pleasantly surprised when the trail finally leveled off, and we saw the Ranger Station at Golden Lakes (5130 ft.), our camp for the evening. The friendly ranger allowed us to take a peek inside the cabin. Compared to our tent, it looked like a pretty cozy place to call home for a few days. Golden Lakes was our first time being assigned to the group site, and we were eager to see what that would mean. The site was larger than most and came with an incredible front porch view of one of the lakes. Despite its size, the whole site was assigned to us alone. Score! Golden Lakes is one of the prime campsites on the Wonderland Trail, and it can be very difficult to get a permit to stay here. We felt incredibly lucky to be some of the privileged few camping at this popular site that evening. We had a pleasant afternoon exploring the area, taking a refreshing dip in the lake and marveling at the grand trees festooned with colorful lichen. While Matt caught up on some of his reading, I took advantage of the occasion to photograph some of the lovely flowers found around the camp. We made our dinner up at the sunset viewpoint between sites 4 and 5 and chatted with the other hikers gathered there about their adventures on the trail thus far. Most of them were traveling in the opposite direction, so we took advantage of the opportunity and inquired about what to expect along the trail ahead. We were given lots of good advice, and we enjoyed the sense of camaraderie that had felt somewhat absent in the other camps we stayed in. Before long, it was time for the sun to set, and the crowd grew quiet in order to fully take in the glorious event. From our vantage point, the view was magnificent, and we could see all the way to the Olympic Peninsula and Puget Sound. Though a bit hazy, the sunset was brilliant—a perfect ending to yet another gratifying day on the Wonderland Trail. We woke up to another beautiful sunny day this morning and prayed to the weather gods that our good fortune would continue for the rest of the trip. Until this point, the weather had been simply glorious, and we had only experienced about 5 minutes of rain in the first 5 days of our trek. How long would it last, we wondered. Today’s journey started with a gradual contour up to meadows that were filled with stalks of bear grass and blueberry bush. We were warned in camp the night before that this section of trail was prime habitat for bears, and no more than 45 minutes outside of camp I spotted a dark brown figure on the hill just above the path. I stopped dead in my tracks and pointed the bear out to Matt. We approached cautiously, trying to get beyond it before stopping to take any photographs. This was Bear #5 for us, and we were thrilled that, just like his predecessors, this one couldn’t be bothered to pay us any attention on his quest for a mid-morning snack. We snapped a few pictures and moved along quickly. Eventually we plunged back into the forest and had a big downhill until the crossing of the North Puyallup River (3750 ft.). Here a sturdy bridge made crossing the rushing river a cinch, and we took some time to admire the view of the impressive waterfall from the vantage point on the other side. From there, it was a tough 2.8 mile uphill climb through overgrown bush scrub to Klapatche Park (5515 ft.). We had to keep a careful eye on the trail here because it was difficult to see our footing. A misstep on an eroded section could lead to a tangled fall. Klapatche Park is regarded as one of the most beautiful camps on the Wonderland Trail, and when we arrived it was clear to see why. 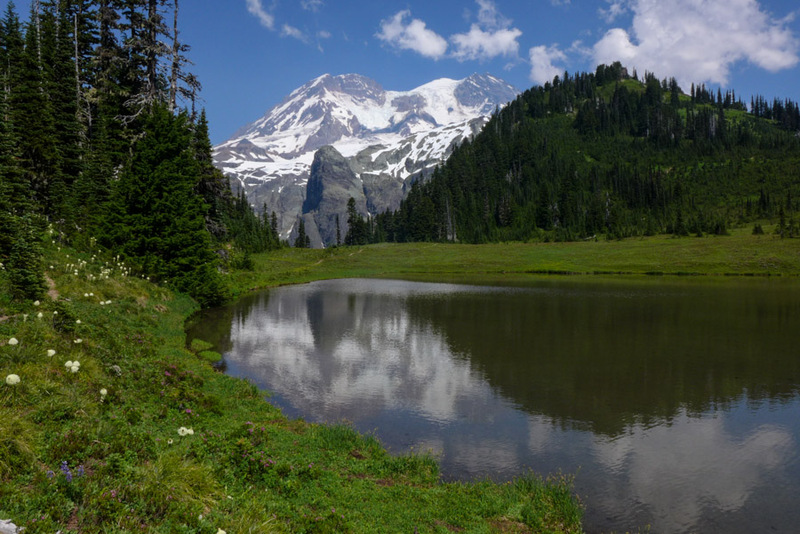 There is a small, picturesque lake located right in front of the campsites with an amazing view of Rainier just above it. Capturing the reflection of the mountain in the lake at sunset is a photograph we longed for, but, without a permit to stay the night, we had to settle for a shot in the bright afternoon sun. Nonetheless, we enjoyed the splendid views over a quick lunch and had fun chatting with two young boys, age 11 and 14, who eagerly greeted us on our arrival into camp. They had almost completed the circuit with their father and an even younger brother. We told them how impressed we were with their accomplishment, and they beamed with pride. Matters took a more serious tone when they asked if we wanted to trade food with them. Game for a little fun, we agreed, but, as vegetarians, they had little to offer us. We did finally agree on an exciting Starbust/Skittle trade, and we couldn’t help but laugh as we watched the boys carefully count out each one of the candy treats to make sure that all negotiations were fair. After lunch, we had a steep uphill to beautiful St. Andrew’s Lake (6000 ft.), where Matt couldn’t resist taking a quick dip even though the water was absolutely freezing. I wasn’t so brave and opted to soak my sore feet in the frigid water while documenting the occasion. Matt did his best to stay in the water and keep from hyperventilating long enough for me to snap a few photos. I should have included the large bank of ice to Matt’s left in the photo to prove just how cold it was, but I was so mesmerized by the beautiful scene before me that it didn’t occur to me until he was already out of the water. He assured me that there was no way he was getting back in for another shot, so I guess we’ll just have to go back someday, hopefully soon, and do it again—this time with a stay at Klapatche Park. Back on the trail, our clean, refreshed feeling didn’t last long. Right away, we hit another short uphill section through St. Andrew’s Park with its pretty wildflowers before beginning the long descent to South Puyallup Camp. Despite having another 3.2 miles and 1800 feet of downhill switchbacks yet to go before reaching our final destination, we made sure to stop and smell the flowers. Today’s journey was just about as good as it gets as far as hiking goes, and we wanted to savor every bit of it! We finally reached South Puyallup Camp (4000 ft.) just before dinner time. This camp is located right next to the Puyallup River, and the sound of the rushing water provided a nice soundtrack for the evening. The sites here were sizable but more or less in view of one another. There was a very small creek on the trail to the toilet, but it was running rather dry and looked dubious. We opted to backtrack down the trail a quarter of a mile to a more promising water source, which was exactly a quarter-mile longer than we wanted to walk after backpacking for 11 miles. A trip to the privy in this camp was quite a hike, too, but it led us right past an enormous wall of impressive andesite rock formations called The Collonades. Of course, we were kicking ourselves because we left our camera back at the campsite and had to go back to get it. The rock wall is definitely worth a diversion if you are not staying at this camp, but be sure to bring your camera with you if you decide to make the side trip! We had a lazy morning in camp after an exhausting Day 6, our longest hiking day yet. We did manage to make it out of camp by 8:30 only to start the day with a strenuous climb up to Emerald Ridge. There was very little conversation as we both found it hard to get the legs going on this abrupt start to the day—our legs felt like they were stuffed with lead. It was wonderful to finally emerge out of the woods knowing that our big climb for the day was done! 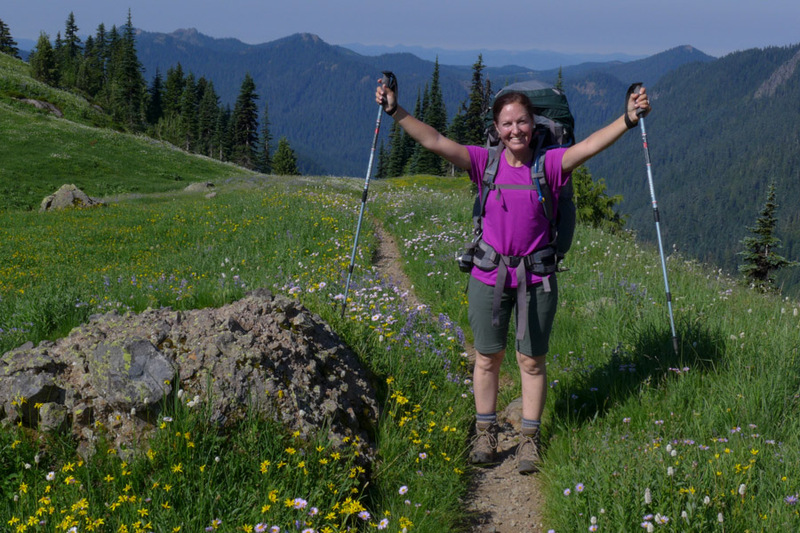 Our mood continued to pick up when we hit the meadows of Emerald Ridge (5600 ft.). Profuse blossoms spread as far as the eye could see, and, with a gorgeous western view of Rainier and Tahoma Glacier as the backdrop, the scene was the perfect remedy to the tough morning hike. Hiking in a counter-clockwise direction, we came to a small side trail leading up to a little knoll above the main track. The vantage point from there was spectacular and definitely worth the little bit of extra effort required to reach it. We dropped our packs and took in this amazing vista over a well-deserved snack. After taking many photographs of the jaw-dropping scene, we tackled an equally steep descent down to the engineering marvel of the Tahoma Creek Suspension Bridge. Hanging 165 feet above Tahoma Creek and stretching for a whopping 200 feet to the other side, crossing this bridge is not for the faint of heart. After convincing ourselves that there wasn’t any possible way to fall off the bridge unless you were actually trying, we went for it, stopping midway to admire the amazing view. Even going one at a time, the suspended wooden walkway swayed and bounced with our weight—a little unnerving to say the least! From there, we made our way up to Indian Henry’s, taking a nice long break at the top of the uphill on a large boulder with glorious views of the western slope. A signpost at a junction in the trail pointed the way to Mirror Lakes, a short .7 mile detour that the ranger at Longmire said we shouldn’t miss. We ditched our heavy packs there and traveled light with only cameras and a tripod. What a treat that was! Along the way, we stopped frequently to admire and photograph the colorful meadows with Rainier in the background, and we finally got the reflection shot we had missed at Klapatche in the first of the two Mirror Lakes. Back on the trail, we passed the Indian Henry Patrol Cabin. Built in 1915, this is the oldest cabin still in use by the park service today. Its stunning location was the former hunting grounds of Indian Henry, a well-known Native American who made this area his home. From there, it was mostly downhill to Pyramid Creek Camp, a small and lightly-used camp. We had to backtrack just pass Pyramid Creek for water, but the watering hole was absolutely beautiful and worth the trip. Located right next to the trail, its clear waters emerged from mossy rocks at one end into a large, sandy-bottomed standing pool. A thick wall of salmon berry bushes served as a backdrop. The whole scene looked so inviting, but the water was icy cold; we could only stand to keep our feet submerged for a few seconds at a time! We kept remarking how this watering hole would make one of Rainier’s black bears so happy. On a hot summer day, a bear could actually sit in the cool waters while feasting on the plump salmon berries. 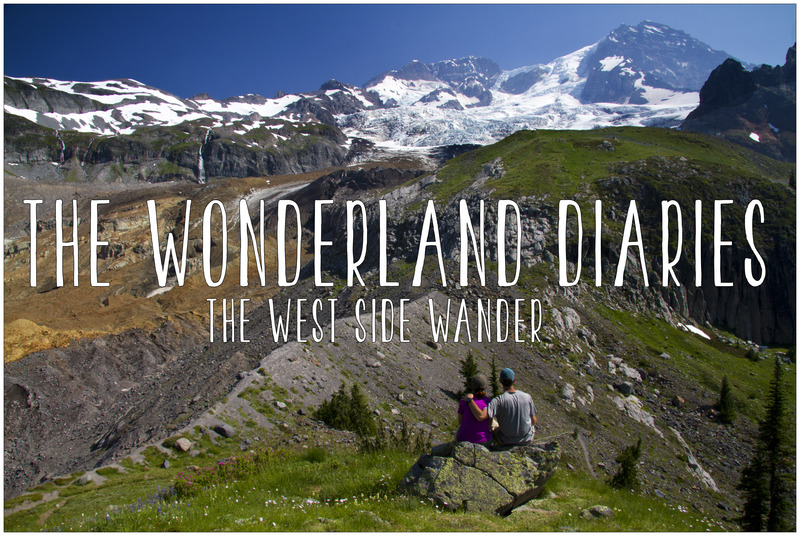 We wondered if any Wonderland hikers have ever been lucky enough to stumble upon that scene. Water filtered, we headed back to camp and very efficiently cooked dinner, set up camp and cleaned the dishes for an early bedtime. We had big plans in store for the next day! We had an early morning departure today with a goal of skipping our standard oatmeal breakfast for the joys of civilization at Longmire (2780 ft.). It was a quick three miles downhill to a hot breakfast at the Longmire Inn. A plate of scrambled eggs, hash browns, a homemade biscuit and a hot cup of coffee never tasted so heavenly! Longmire is one of the main visitor centers in the park, so lots of amenities and services can be found there. With a relatively easy day on the trail, we wanted to make the most of our brush with civilization. After breakfast, we had a little time to kill waiting for lunch. We checked out the different museum exhibits on the history of the park and strolled along the short interpretive nature trail. We spotted a doe and her fawn peacefully enjoying a skunk cabbage breakfast. After a few hours off the WT, it was time to pick up our second cache from the Wilderness Information Center. We repacked, refueled and then re-cached a few unwanted items for the rest of the hike, knowing that we could pick them up at a later time on our drive out of the park. With only four days to go, we had a better sense of exactly how much food and fuel we would need to complete the journey. There was no sense in carrying any extra weight, so we left behind everything deemed unnecessary. Not wanting to let an opportunity to indulge pass us by, we hit the small grocery at the giftshop for some cheddar cheese and cold beer. Topping that off with the Pringles we had packed in our cache, we were living the dream! From Longmire, the Wonderland Trail parallels the main road through the woods for a while before crossing the mighty Nisqually River. After that, a gentle uphill led us along Paradise River past Carter Falls to Paradise River Camp (3805 ft.). It was a small but pleasant camp that was very full that evening. A large hiking group occupied the group site, and the bear poles were so full that we found it challenging to find a spot to hang our food and toiletry bags. After getting our camp chores done, we spent the rest of the afternoon lazing by the river where we spotted an American dipper in action. Watching the small bird feeding while negotiating the river’s rapid currents was quite a spectacle. We read in our guidebook that we might also have the opportunity to hear or see some spotted owls in the tall canopy above the camp that night, but we weren’t so lucky. Maybe next time! We so enjoy the photographs and lively text — and the idea of Matt freezing for the photo. Thanks for stopping by, Judy! Matt is usually game to take a dip almost anywhere—freezing or not. Me? Not so much. Maybe that’s the difference between growing up in Wisconsin and South Carolina! Too funny, Andy! We haven’t managed to travel back in time yet, but maybe we’ll meet some famous people out there on the trail some day!